Sam: I am so tired of being cynical. Richard: Cynicism is to millennial American fiction as dust is to Steinbeck, and you, Sam, are filled with cynicism. So just consider yourself lucky. 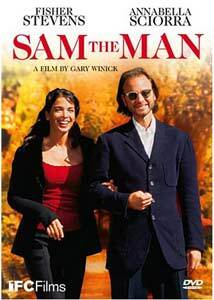 Sam the Man is the result of an experiment by director Gary Winick, who , in the late 1990s, envisioned gathering together a repertoire of experienced actors and crewman and, using the then fairly recent innovation of digital video, produce a series of films on the cheap. With budgets capped at $100,000 and everyone working for $100 per day, the films would do things that couldn't be done in Hollywood films, yet they'd have a polish missing from many indies. The plan didn't work out as he'd hoped. Though that company did eventually emerge, Sam the Man flopped—it failed to make it into any many film festivals and never played in theaters (it eventually premiered on the Independent Film Channel). Still, it's an interesting movie, worth watching, and a good sight better than many Park City prizewinners. Fisher Stevens (himself a partner in independent distributor GreeneStreet, which backed the film) plays Sam, a once-successful New York novelist suffering from creative paralysis, despite the encouragement of his agent (Ron Rifkin) and his fiancée Cass (Annabella Sciorra). He works as little as possible (calling a teaching job a way to make "beer money"), sells his prized photographs to pay the rent (his landlord is played by character actor Luis Guzman), and spends the time he should be writing cheating on Cass with every woman who crosses his path. Sam is profoundly unlikable, which poses a problem for director Gary Winick and screenwriter Kevin Kennedy, who have to try to make him tolerable without betraying the character. Stevens gives a decent performance, but the script never really gets inside Sam's head, so we don't understand why he makes the choices he does, choices that cause his life and personal relationships to fall apart—we just feel he's getting what he deserves. On the plus side, the picture doesn't end neatly, with Sam learning his lesson, succeeding as a writer and a romantic. Sam frankly doesn't earn redemption, and at least the creative team had the good sense to realize it. After all, this is a guy who talks to his bride-to-be on the phone while with his mistress, and later, when found out, can't even say for sure how many women he cheated with ("Two... six?"). Movies about unlikable people can be insightful and worthwhile, but Sam the Man merely shows us a few months in the life of a guy who is profoundly insecure and really not very nice, and does nothing to explain why he is that way. Larger script problems aside, the movie is fairly enjoyable on a scene by scene basis, thanks to some funny dialogue, a strong lead performance, and an excellent supporting cast of New York mainstays. The aforementioned Rifkin and Guzman are always great; the ensemble also includes Maria Bello, Rob Marrow, and Griffin Dunne (and keep an eye out for a pre-Law & Order: SVU Mariska Hargitay). Winick does a good job turning the low budget and the limitations of digital video into a plus, and though it's not what I'd call pretty, it's well shot and nicely composed (Winick would go on to win great acclaim for his next DV feature, the Sundance winner Tadpole, and found InDigent, a company that specializes in cheap, professionally-produced digital video features). Image Transfer Review: An early mini-DV film, shot with natural lighting in the Dogma tradition, Sam the Man exhibits all of the drawbacks of the format, as well as its inherent, raw immediacy. The image doesn't look like video, thanks to some digital trickery, but it's very grainy, with dark scenes sometimes very difficult to make out, and infrequent, rather severe color blooming. None of these problems are the fault of the DVD master, however, so assigning a grade becomes somewhat arbitrary. Just know, it's supposed to look like that. The picture isn't anamorphically enhanced, but in this case, the loss of detail won't make much difference. Audio Transfer Review: Audio is presented in a basic stereo mix that perfectly suits this dialogue-based film. Speech is always clear, and since there's no score, that's really all you need to know. Extras Review: Winick and Stevens get together for a retrospective commentary, and though they start out well, discussing how they shot the film, pointing out favorite moments, and praising fellow cast members, they very soon quiet down, lapsing into silence for brief periods only to remark about where or how a particular scene was shot. It's an interesting track, above average, but a little slow going once you hit the halfway mark. A 15-minute featurette is entertaining throughout, though. Winick, speaking on camera or narrating behind-the-scenes footage, talks abut how Sam the Man was an experiment, intended to prove a film could be made for $100,000 with proven actors and directors all working for $100 a day for the pure love of film. Even though the movie didn't start fires, he explains, it did allow him to form InDigent, a company that has since produced such diverse efforts as Richard Linklater's Tape, Pieces of April, and Winick's own Tadpole. Five deleted scenes, totaling just over five minutes of footage, don't add much, but are worth a look, particularly an amusing extended take with Luis Guzman. The outtake reel (9m:38s) is also pretty funny—a combination of on-set footage and blown takes, it proves the actors may not have been making a lot of money, but were having a lot of fun (though at least one woman on the crew was definitely not amused by Stevens' propensity to joke and ruin the shot, since she keeps intoning, "Still rolling!"). Unfortunately, there are no subtitles. Sam the Man is an interesting film, a low-budget experiment with a profoundly unlikable main character that doesn't quite come together, but nonetheless succeeds at subverting Hollywood formula. For a picture that never picked up a theatrical distributor, New Video has produced a very nice DVD.